The year 2009 has been a difficult one for many people in many ways, a year of great economic hardship and dreams lost, of global conflict and cultural friction, a year of immense turbulence for nearly every citizen of this little blue planet of ours. So we feel it is entirely appropriate to close out this chaotic year with an album of sublime peacefulness and inspired awakening. 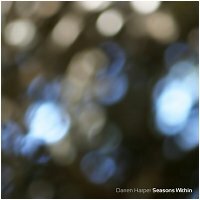 Thus, we unveil Seasons Within, the newest release from Colorado ambient prodigy Darren Harper. And what a glorious collection of active meditations these tracks represent. The album was born through experimental improvisations inspired by the early Autumn snows and high winds Darren experienced this season in his lovely home town in the Rockies. He reports that this is his favorite time of year, and this music is is a direct expression of his love of the colder seasons. The pieces are what he calls "improvised drones and tonations" that reflect the inward contemplation and reverie that is characteristic of autumn. He hopes that this album "helps usher in that experience for the listener as well". We could not pick a better word than 'reverie' to describe this release. As is typical of any of Darren's work, the music is thoughtful and brilliantly constructed, with his trademark depth and craftsmanship. But another word we would use to describe it is 'profound', for in listening to the album end to end, it is impossible not to feel the remarkable sense of tranquility and centeredness that the music endows. As a result, Seasons Within is as useful as a meditation aid as it is a comforting backdrop, every bit as soothing as a warm blanket and a hot cup of tea on a cold evening in the mountains. Very simply, this is some of the most intelligent ambient music we have heard in a long time. So as we look back on 2009, we realize that, despite the challenges, there were some definite bright spots - and the emergence of so many gifted musicians like Darren is definitely among them. Darren Harper is truly an amazing ambient artist, and we could not be prouder to bring his music to our listeners, or to close out the year 2009 with his majestic release Seasons Within. The album is like a wave in the ocean; sometimes moods of lightness and warmth swell to the surface, sometimes darkness and coldness emerges from it. Initially I only intended to listen to one track of the album to get a feel for it, but the music completely hooked me on and listened through the whole album. This is without doubt one of the best ambient albums I have ever heard, it is right there at the top with Roach's work. for me, one of the best ambient releases ever. what a great artist.